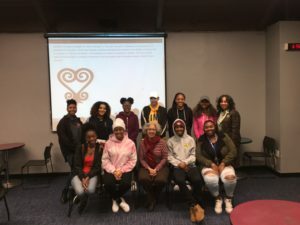 Every Monday the ladies of the Student African American Sisterhood (SAAS) gather together in the Santos Manuel Student Union Bay to discuss strategies for educational attainment and success throughout the collegiate experience and beyond. 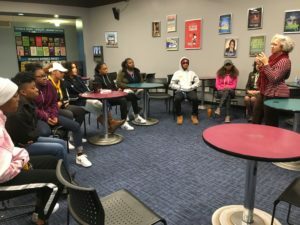 SAAS members gathered at their weekly Monday meeting while Professor of Theatre Arts, Kathryn Ervin discusses the importance of being black and educated. The Student African American Sisterhood (SAAS) is a nonprofit organization dedicated to unifying African American women, provide strategies for educational attainment and support the personal and professional development of young ladies of color. 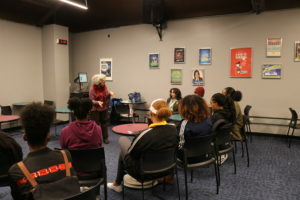 this particular Monday SAAS event coordinator Key invited Department of Theatre Arts professor Kathryn Ervin as the guest speaker where she talked about how early support was the key to her success. It’s all about taking on different causes that we can help out with women and being truly helpful to those in need.Twillea Evans-Carthen SAAS advisor at CSUSB and Director of Ombuds Services. SAAS has six core principles that serve as a framework that guide the organization, meetings, events, and activities. For instance, Social Unity, Academic Excellence, Cultural Enrichment, Personal Development, Financial Affairs, and Service Learning. SAAS welcomes anyone who is looking to be involved in campus and is willing to make a connection with their fellow peers in their college experience. One of the SAAS members Amya Gibbs a sophomore shared how SAAS has helped her come out her shy phase. SAAS Event coordinator, Kiara “Key” Mabien emphasized how important it is to make sure that the SAAS ladies empower one another. Below Kiara, shared how her role has helped her realize some characteristics about herself. The SAAS consist of educated young ladies that strive for personal growth and academic success of participants through educational programming, conferences, and resources. They hold weekly meetings on Monday’s in the Santos Manuel Student Union Bay from 6:00 p.m.-7:00 p.m.
pictured are some of the SAAS members, SAAS advisor, and guest speaker Kathryn Ervin pose for a flick after their Monday meeting. SAAS ladies are encouraged to set positive examples for one another by implementing leadership and sisterhood in the academic environment and in the community. SAAS’s does not have any requirements to join the organization, individuals who are interested just have to attend the weekly Monday meetings in the SMSU 6:00 p.m.-7:00 p.m.
SAAS members focused on Kathryn Ervin sharing her views on why it is important to be open to new opportunities. There is no membership fee and anyone is welcome from any cultural background even if they just want to come for the various academic resources offered from the SAAS organization.